At the center of a bustling junction, the Victory Monument, Bangkok towers majestically above the hive of activity that surrounds it. This monument is another masterpiece created by Corrado Feroci in 1941 as a memorial to fallen servicemen and civilians. 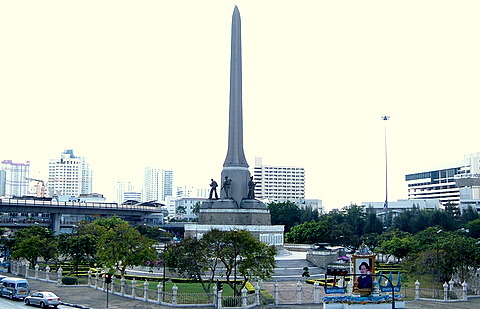 The Victory Monument consists of an obelisk ringed by six statues representing the army, navy, air force, police and civilians. These were the casualties in the Franco-Thai War from November 1940 – January 1941, over the disputed provinces of Battambang and Siem Reap, in what is presently Cambodia and territories to the west of the Mekong River along the Thai-Laos border. In 1940 after the defeat of the Vichy government in France by Nazi Germany, Thailand under Phibun Songkhram tried to reclaim border territories lost in 1893 when the French navy blockaded the Chao Phraya. In November 1940, Thai troops advanced into the area west of the Mekong River opposite Luang Prabang and Champasak in Laos and Battambang and Siem Reap in Cambodia. At sea, there was also a naval engagement between the Thai and French navies near Koh Chang or Elephant Island in the Gulf of Thailand near the Thai-Cambodian border. Historical accounts differ as to the actual events in this naval battle. Thai accounts claimed a French cruiser and six other vessels from Saigon launched a surprise attack on Thai ships anchored off Koh Chang. Three Thai ships were sunk with a loss of 60 sailors. Thai airplanes bombed and chased the French navy back to Saigon. French records however maintained that there was an engagement between five Thai ships and seven French vessels. Three Thai ships were sunk with one badly damaged. The French navy returned unscathed to Saigon in spite of being pursued and bombed by Thai airplanes. What can't be disputed is that the Thai navy suffered a serious blow. Japan, already in North Vietnam at that time, intervened and forced a ceasefire in January 1941. A treaty was signed in March 1941 allowing Thailand to retain the disputed territories. After World War II, Thailand had to return Siem Reap and Battambang to France as part of the reparations for its wartime collaboration with Japan. The names of the 656 fallen servicemen and civilians are inscribed around the base of the monument, which is fenced in and surrounded by trees. The area around the monument is a major transportation hub for buses and minivans to almost all parts of Bangkok and to some provinces. From the sky train station 100 m away, the track loops around the monument giving passengers a panoramic view of the area. A pedestrian walkway just below the skytrain line allows visitors to walk around and view the monument from different angles. The roads below have a constant flow of heavy traffic round a busy area thronged with people. In a distance, construction cranes are busily adding on to an already heavily built up area. Amid all this commercialization, the Victory Monument remains undisturbed, as an enduring tribute to the nation's defenders and a legacy to Feroci's artistry. The fastest way to get there is by Bangkok skytrain to N3 Victory Monument station. The skytrain line continues northwards to terminate at N8 Mor Chit station where the Chatuchak weekend market is located. A ride on the skytrain past the monument gives a panoramic of the entire area.